Participants take part in the Vancouver Sun Run. Register Your Team Today or Join a Team! 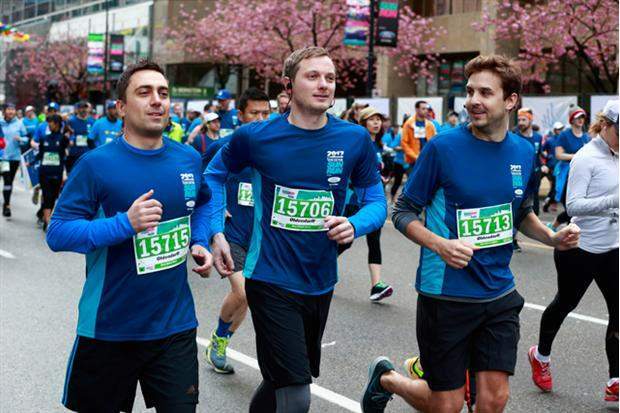 The Vancouver Sun Run Canadian Western Bank Team Division is an extremely powerful opportunity for team building, friendship and camaraderie amongst employees, teams and friends! Each year the Vancouver Sun Run attracts over 1000 teams consisting of ten or more participants. Create your team today and experience Canada’s largest start line, click here! Each team member will receive a SOUVENIR TECH SHIRT printed with your team name (max 30 characters) or logo! Team shirts are couriered to you free of charge! Fun finishers’ party on race day! Click here to download a Team Poster you can edit with your information, save and email out to your members! IMPORTANT NOTE: All registrations are considered final. NO REFUNDS. NO TRANSFERS. How to get Started – Create an Open Team! RECRUIT: Minimum team size is 10 people. Register your team of RUNNERS, WALKERS OR WHEELCHAIR participants. All co-workers, colleagues, friends or family are welcome! Team captains must first create a new Team for 2019 by clicking the “Register Now” button above. Choose “Create a Team”. Please note: Adults & youth may participate in the Shaw 2.5k Mini Sun Run as part of a Team when they register and pay the full team rate. Team members participating in the Shaw 2.5k Mini Sun Run, will not have their names listed in the Vancouver Sun Run results as this is not a timed event. Youth participating in the 10K Vancouver Sun Run or Shaw 2.5k Mini Sun Run as part of a team must select an adult sized tech shirt, youth sizing is not an available option in the Canadian Western Bank Team Division. Finishers’ times and positions are recorded at the finish line. The team’s score is based on the accumulation of the top 10 team members’ placement (i.e. what place they come in crossing the finish line based on their gender). Vancouver Sun Run Sponsor teams do not qualify. Team Shirts: Teams have an option to have their team name OR logo on the back of their shirt. Click here for shirt artwork specs. Exclusive to the Open Team Division, you can choose to set-up the team’s registration fees to be invoiced directly to your corporation or organization. Invoiced registrations are considered as a paid registration therefore considered final with no refunds or transfers allowed on invoiced registrations. Payment must be received in full by April 2, 2019 in our office or you may choose to make payment online by that date. Your team’s race bibs will not be released at package pick-up until full payment is received. Your Team Captain would have shared a link for you to join your Open Team; alternatively you can also search the registration site by your team name. Click here to join your team today! Team Shirts: Team shirts will be delivered to the address provided on the team registration form (completed by the Team Captain). These will be directly shipped from the screen printer. All teams will receive their team shirts by April 10, 2019. Team Bibs & Timing Chips: Team Race Bibs and Timing Chips are conveniently grouped together for easy pick-up. Team Captains must pick up at Gate H, at BC Place Stadium on the following dates and times below. Team Captains can also send a courier or other team members to pick up. The cost of a courier is not included in the team registration fee. Please ensure they have both the company name and team name. Please Note: Race packages for team members’ friends or family who are NOT part of your team and are registered as Individuals, must pick up their package separately at/during the Sun Run Fair.